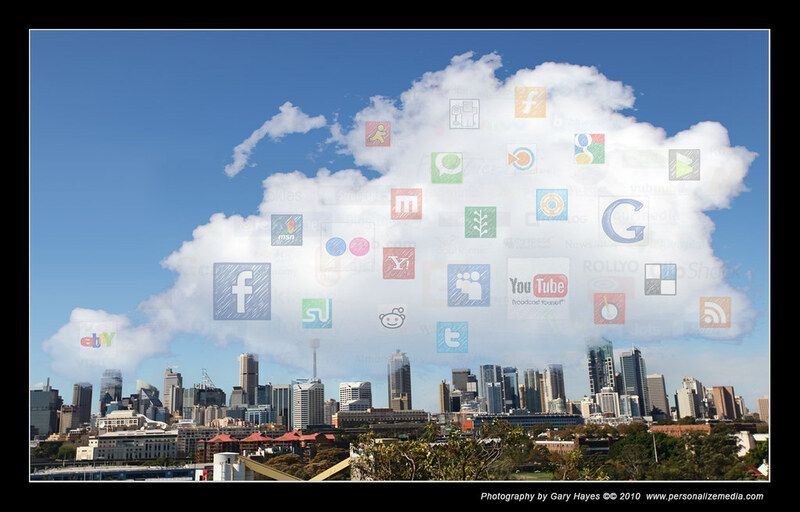 What happens when the content cloud descends? Rocket science or people science? 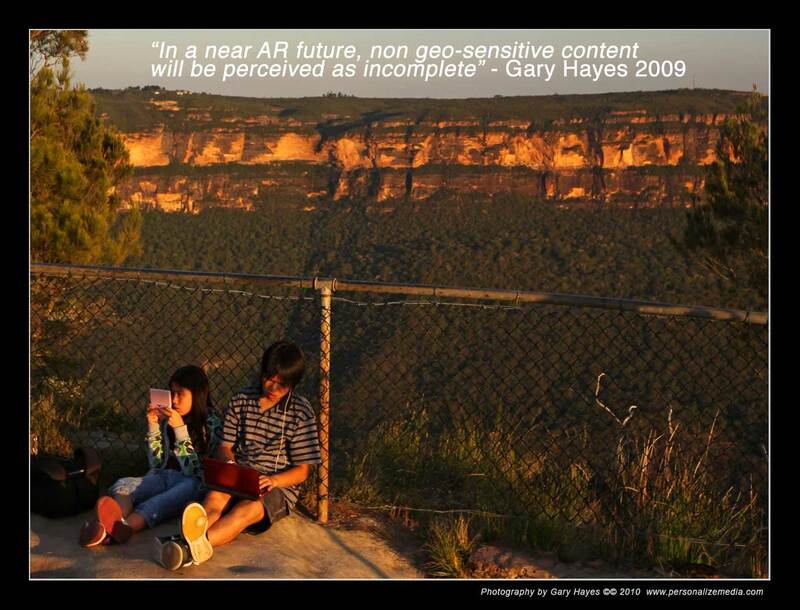 Here is a really simple metaphor to illustrate the pervasiveness and societal significance of Augmented Reality. For the past 20 years humanity has been ‘floating’ its content (its personas, its information, life data, economy and social media) creating a distant, electronic cloud drifting, conceptually, way up above us. A cloud that is only reachable when we area able to connect to it via a variety of fixed and mobile ‘information’ screens, themselves connected to a veritable wormhole aka the global internet. (In reality hundreds of thousands of servers murmuring around the world with billions connected via hard wiring to receive richer media & experiences). But that cloud, has reached saturation, it no longer can keep afloat, there is just too much or rather just enough content to be temporally and geographically relevant. In other words there is so much ‘stuff’ up there that it now makes sense to access it, in a true Web 3.0 way, in real time, the present moment from anywhere you are. It will at its simplest level be Google Earth, slowly morphing out of your PC screen, growing to global scale and locking into place over the real world or Facebook mapping itself onto the billion users faces out in the street, advertisers reaching out to where ever you are, personalizing your everyday life with relevancy vs noise. The always on cloud has now become very useful to a range of stakeholders. Marketeers, storytellers & users alike. Mists of information, media and experiences will engulf onto our cities and physical infrastructure, it will become a persistent fog that will coat everything in its path with layers of time and place stamped content. It will create a web of layers, of parallel narratives and realities and enhance our experiences. OK fluffy intro over and this leads to some high level areas of a ‘consultancy’ whitepaper I did mid last year (which annoyingly I still can’t publish) but some key themes are explored below. What does this mean on the ground, a ground covered in this fog of information. The transformative effect of our physical world being invaded by ‘cyberspace’ will make the current discussions about social network privacy seem like a children’s party. When the ‘web’ spreads into and permeates our real world will their be any hiding places. As portable screens become practical (think iPad with camera), pervasive wearable computing becomes commonplace and surveillance technology evolves to being ubiquitous and transparent – society will evolve way ahead of government and law, who powerless to stop the flow of information on connected screens will be even more powerless to stop this flow moving into real space? “Augmented reality allows people to visualize cyberspace as an integral part of the physical world that surrounds them, effectively making the real world clickable and linked,” says Dr. Paul E. Jacobs, chairman and CEO of Qualcomm. The videos below might give them ‘digital’ food for thought. Beware: I would like to point out everything below has already happened or about to launch in the next few months. My slides below from my presentation at one of Australia’s industries leading advertising conferences yesterday which I had previously blogged about “The Advertising and Marketing Summit” It was a jam packed room with around 400 attendees of marketing movers and shakers. I closed the second day with the talk on ‘engaging in virtual communities’ followed by a great talk on Word of Mouth Marketing from Piers Hogarth-Scott, CEO, Yooster & Trustee. The general tone of the two days seemed to be the usual big broadcast ‘dry-up’, mobile is not quite here and the ramp up of ‘online’ marketing. Sadly online, as a platform, which to me is a multi-faceted beast (basically it is everything that has been before and much more) is still seen by this particular segment of the industry as only about search and web 1.0 push. Laurel Papworth at least raised some questions at the end about making sure companies seriously consider Social Media Marketing at executive level and my key points at the end were get in there, spend time and really understand the culture in the vast range of virtual worlds before making a decision to do any R&D or full blown campaigns. The Future of…well what? Consultant waffle? Personal Cloud – content we own and create – From this rains down the ‘precipitation of participation’ – sharing our photos, stories and lives with others – To what extent do we control our Personal Cloud? Every individual can become a producer of content which is available to everyone else – if they want it. Now anything is available on demand from anywhere over vast broadband networks. Everything is ‘pulled’, only personally relevant content is ‘pushed’. The home becomes a personalised entertainment and life system where everything is centralised – games, video, shops, audio, text, email & vmail & banking. 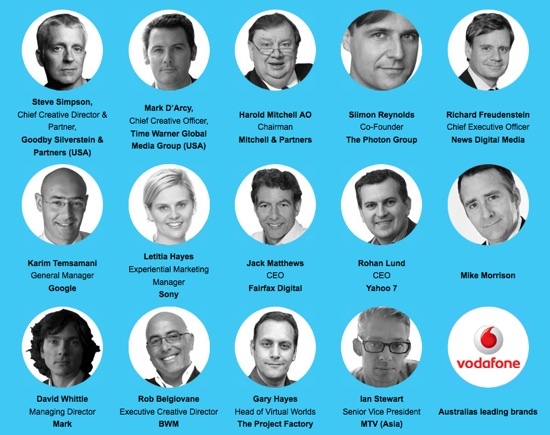 OK as with all “Future of Media” conferences we come to expect lots of waffle, fluffy guesses as to where Social Media or New Gadgets (iPhone, yawn) will really take us. 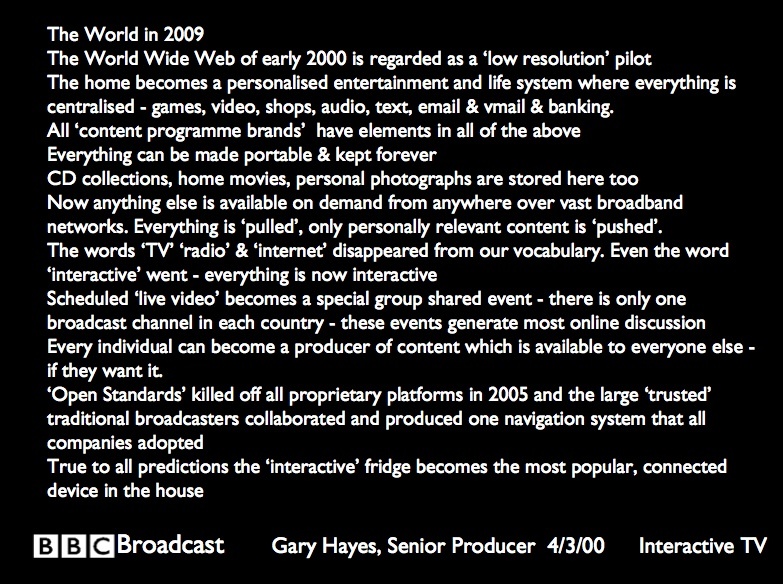 Most talks I did for TV-Anytime and BBC around 2000-2003 covers most of the discussion around future of privacy, targeted ads and personal content systems. But bottom line it really it is about paranoia on the part of traditional media makers able to afford turning to high fee ‘futurist’ consultants who rarely produce anything apart from a ‘compelling’ stage presence and a book or two to sell. OK I am possibly being cruel but if the content industry is going to grow up it should stop looking for shiny jewels from crystal ball gazing, web trawling, big picture, space cadets and look to hands-on strategists who live and breathe this stuff. Most of the former are jumping on any myth/hype they can use to leverage interest in their ‘expertise’ but it is rarely about the future and often about regurgitating the past within the boundaries of this fresh new high bandwidth, on-demand, two way network. I have talked long and hard in the past about the separation between commentators and producers around cross-media and I have also pointed out academia needs to up its game. I don’t bother to win friends, as you can tell. We are all guilty of Weasel Words when we are asked the ‘where is it all heading question’ but there are others who base their careers on them. Typical ones heard in many a consultation session, “Social Media has enormous implications, it will change the business forever” or how about “Video on the web will produce a sea change of advertising models” or “These social virtual browser based web worlds could be very important for your brand” – client: yes we guessed that, but please tell us how it will in detail, what we need to do to change, in detail and by the way, have you ‘lived’ our business. But lets make this post interactive, which one are you hands-on strategist or space cadet weasel word waffler?